There's no time like summer for tomato lovers. Tomatoes thrive and are at their fresh best in hot, humid conditions, but this doesn't mean you have to say goodbye to them when fall comes around. You can dry tomatoes in a number of ways and keep them on hand during the winter months. If you seal them in a container with as little air as possible, they'll keep up to a year in the pantry and up to 18 months if you freeze or refrigerate them—more than long enough to hold you until fresh, juicy tomatoes are in season again. This method of storing tomatoes in olive oil is much easier and faster than sun-drying them. You won't want to use these tomatoes in dishes or recipes that require additional cooking, but they make a delicious condiment with meats, fish, poultry, or as toppings. Remove the stems and wash them to remove any debris. Wipe them dry. Cut the tomatoes in half. Place them side-by-side, cut-side-up in a ceramic or glass baking dish. They should fit together snugly but not overlap. Sprinkle the tomatoes with sea salt. Add olive oil. The oil should cover about 2/3 of the depth of the tomatoes. Place the dish in the oven and slow cook the tomatoes at 175 F (80 C) for 3 to 5 hours. The exact time will depend on the size of the tomatoes you use. Allow the tomatoes to cool completely, then transfer them to glass jars or other non-metal containers that are as airtight as possible when they're sealed. You can use zip-lock freezer bags instead of containers. Force out all the excess air before sealing them, or—better yet—vacuum-seal the tomatoes if you have the proper equipment. You're not limited to sea salt. Additional seasonings can include fresh or dried thyme, oregano, rosemary, or a little-crushed garlic. If it's not your goal to save your tomatoes for months until the next harvest, you can skip the baking and simply infuse the tomatoes in the oil. 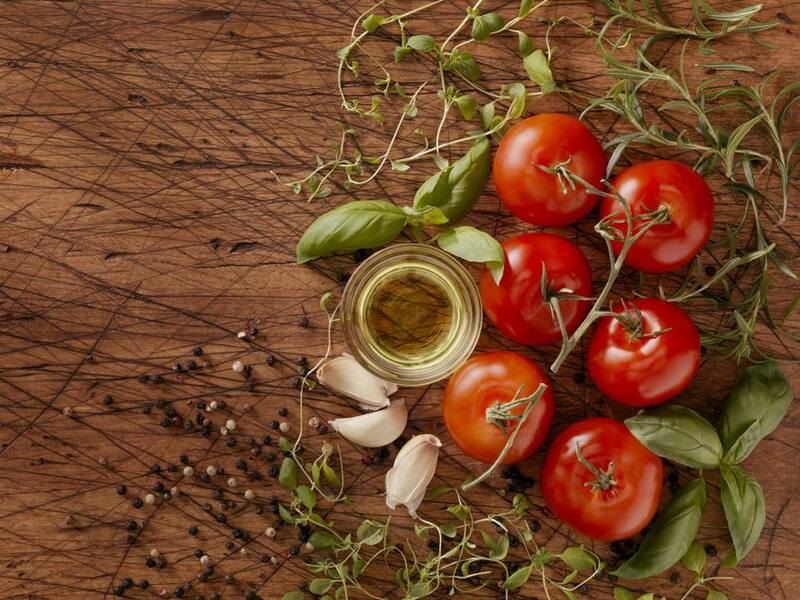 If you skip the garlic, salt, and herbs, the tomatoes will last in your fridge for a few weeks. If you do add the garlic and herbs, use the tomatoes within a week. Oven-drying the tomatoes enhances their flavor, making them ideal as a pizza topping or mixed with pasta. You can also enjoy them as an appetizer, sprinkled with feta or served atop slices of mozzarella. You can use a baking sheet if you don't happen to have a suitable ceramic or glass dish on hand. Line the sheet with aluminum foil, then slowly pour the olive oil over the tomatoes and sprinkle with the salt or herbs of your choice. You'll need about 3 tablespoons of olive oil for every two large tomatoes you prepare. Take care that the oil covers all their surfaces, then bake as you would if you had used a dish.